So there is salad… and then there is THIS salad. 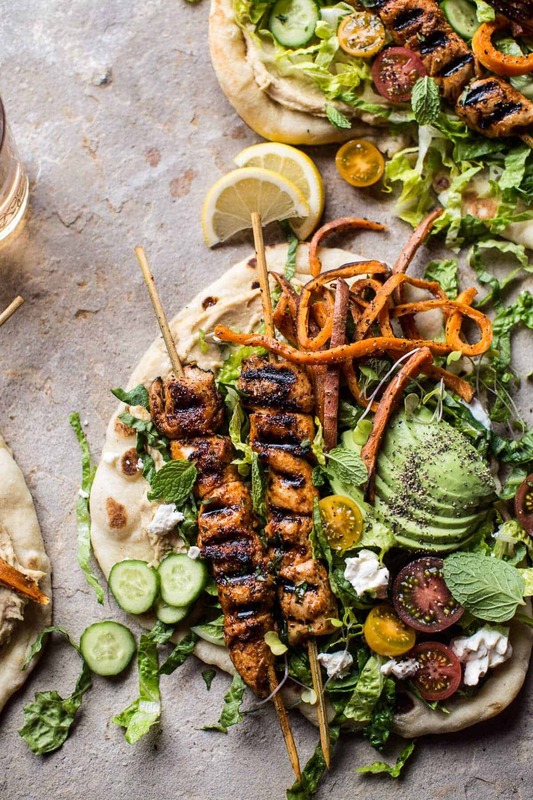 This is more of a salad/flatbread/naan situation topped with EPIC ingredients. It’s really not even a salad, and I deliberated and deliberated for probably close to an hour on just what to call this. In the end, salad seemed most fitting, but promise it’s probably one of the best “salads” you’ll eat. I mean, it’s Monday, I would not give anything short of a KILLER recipe to you on a Monday…cause lets be honest, Monday NEEDS something delicious to help us get through to Tuesday. <–truth. So as of late, I have become mildly obsessed with hummus, middle eastern food and basically anything I can eat with naan. Naan is my kind of bread, and anything I can eat along side it is going to be my kind of food. Middle eastern food and I are having a moment, and I am just full on embracing it. Speaking of this weekend, I have to tell you guys that while the weather was totally and completely crummy…UGH the snow. It was also very productive and um filled with delicious things. I spent some serious one on one time with my younger brother Kai (videos coming soon! ), was told I was a good-looking girl…by a fifty year old man…not sure what to think about that one. I mean, I guess it’s nice, but where are my twenty-two year old guys at?? Come on brothers? You gotta get some better friends, or maybe I gotta get out… maybe both? I also learned that people who look at me every single day really notice when I actually try a little and like brush my hair, brush on a little make-up and wear clothes that are NOT covered in raw egg, flour and beet juice. I got a lot of “wow, you look pretty” this weekend. Not complaining. Kai is headed back to LA today, back to school, so a little sad about that, BUT the good news is that he’s coming back for his spring break in a couple of weeks. I kind of wish I was headed to LA though. Is anyone else completely over the cold and ready for spring?? Evidence of my serious spring fever will be shinning through in a major way this week, and it all starts with this salad. I am crazy about this salad. It’s basically like a Chicken Shawarma wrap, just not wrapped up. You can totally wrap this up to-go, but photographing wraps is my worst nightmare, so I went for leaving them flat…hence the whole salad thing. 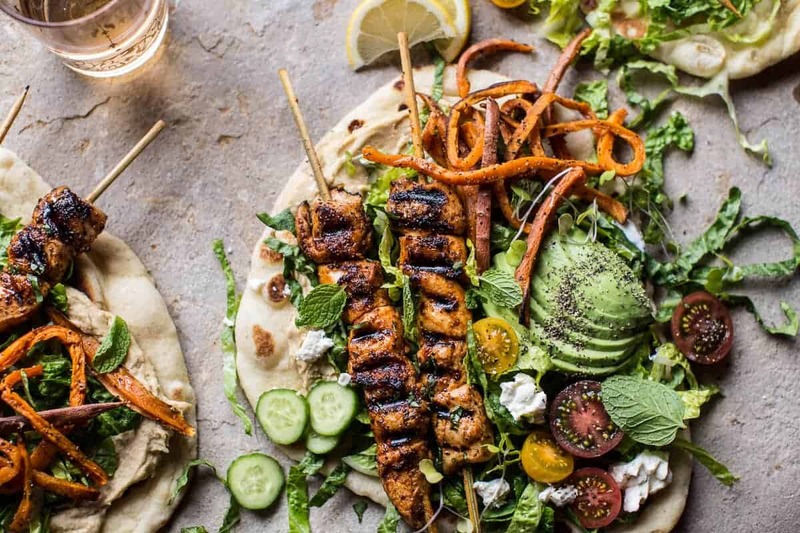 If you are unfamiliar with Chicken Shawarma, it’s a simple middle eastern dish that can be made using either poultry, beef or lamb and is served in or on a pita with a savory yogurt sauce.Chicken Shawarma is a middle eastern street food and guys, it’s completely delish. The chicken gets marinated in a mix of middle eastern spices, garlic, olive oil and tons of lemon. It is tradition to roast the chicken, but I went for skewering it and grilling it. 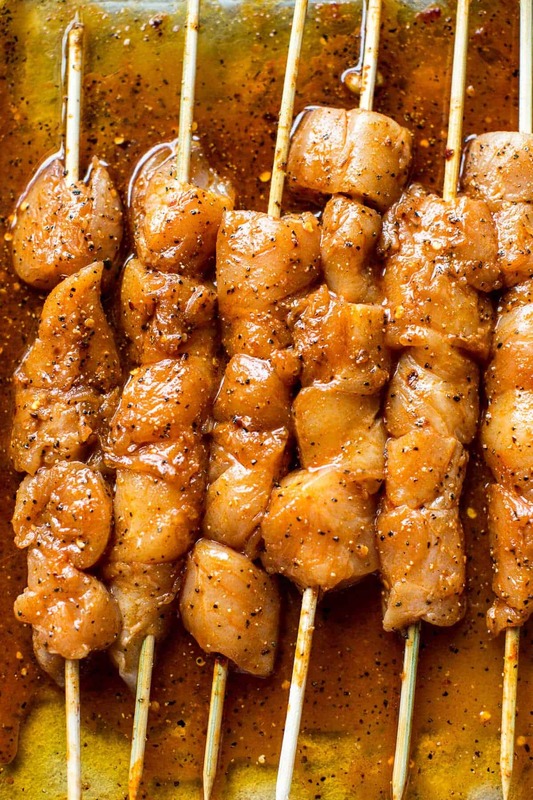 You can certainly roast it, but I personally love this on skewers. The chicken gets a nice char on the outside while staying juicy on the inside. It also cooks up a lot faster than if roasting. However, if roasting sounds more appealing to you, I would use chicken thighs and roast them whole so they don’t dry out. Once you have your chicken marinating, the rest is pretty simple. The sweet potato fries are an obvious MUST here. Again it’s not traditional, but let’s be real, can sweet potato fries ever not be a must? Also, never skimp on the feta, just saying. Place the sweet potatoes on a large baking sheet and drizzle with olive oil, salt + pepper. Gently toss with your hands or two spatulas to evenly coat. Bake for 15-20 minutes, then flip and bake for 15-20 minutes more. You want the sweet potatoes to be tender, but crisp. Set your grill, grill pan or skillet to medium-high heat. 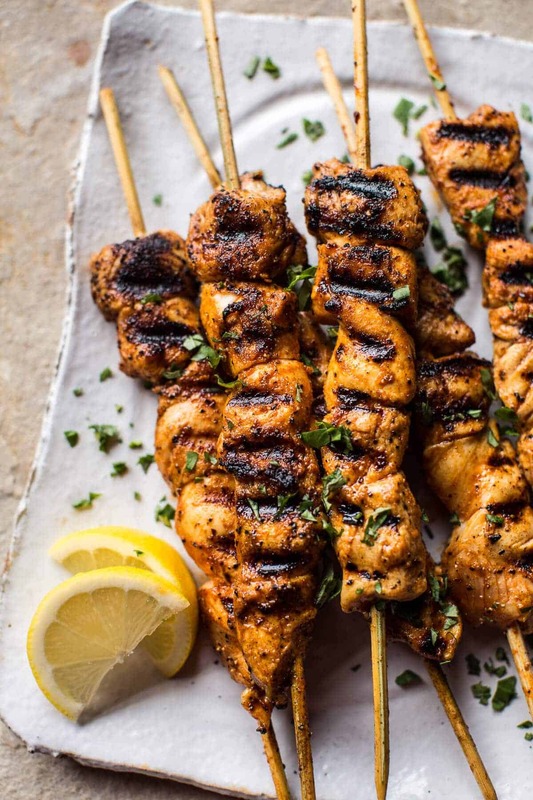 Thread chicken pieces on skewers. Discard marinade. Grill chicken until lightly charred and cooked through, turning skewers occasionally throughout cooking, about 10 to 12 minutes total. Transfer skewers to plate. Combine all the ingredients in a bowl and whisk to combine. Add water to thin if needed. Season with salt. OK, ok, maybe adding in a nap + cookie would really, really help to make the day go smooth. Yup, I sure do know how to do a Monday right…that’s for dang sure. 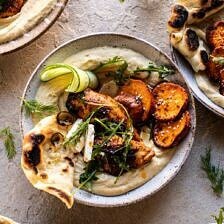 Sheet Pan Chicken Shawarma with Sesame Sweet Potatoes and Hummus. 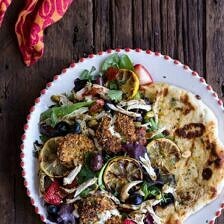 Moroccan Chicken Salad with Pistachio Crusted Fried Goat Cheese + Garlic Naan. I’ll take this over a bunch of leaves any day, that chicken looks perfect! when I noticed an e-mail with the word “shawarma,” I double clicked immediately. Chicken shawarma is one of our favorite ways to eat chicken! I love how you called this a salad, I prefer my salads on top of a huge piece of bread (naan) as well.. Hehe. This looks seriously good. I love fusion food, we’re so lucky to have so much deliciousness to choose from (mix and match to make the tastiest food around, yessssiree!). Love how curly your potato fries are. Makes it all the more fun to eat, methinks! Thanks Tieghan! Thank you so much, Laura!! Oh boy. This is epic!!! I would just get rid of the avocado, as I don’t like it, but all the rest… oh boy! 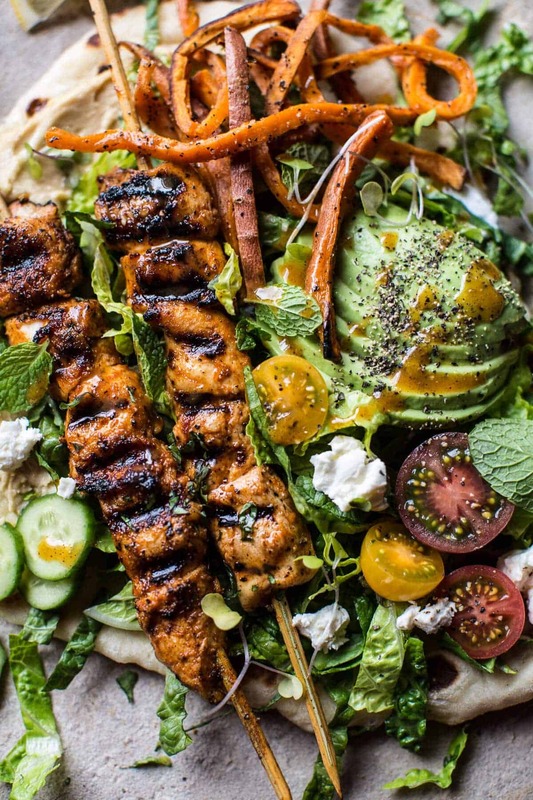 An amazing middle eastern dish! YUM! I love the chipotle tahini! The weather is total ICKKKKKK here too. This would brighten up my day, big time! Hope it gets better soon! Thank you! Thank you SO much, Lynne! Hope you had a great day! Now this is the kind of salad that gets me excited about Mondays!! ? Thanks Mary! Hope you had a great day! Yum! I wouldn’t have thought to add the sweet potato fries but it sounds so good! Wrap it all together like slouvaki and you’re good to go! Writing out my grocery list now!!! Not sure about the availability of Persian cukes tho? I bet your grocery has them, they are just smaller than a normal cucumber and often come in a bag of 6-8. Let me know if you have questions. THANKS! Oh and if you cannot find the, regular cucumber will work great! I would MUCH rather eat this than a salad, LOL! I mean, look at the delicious chicken shawarma and sweet potato fries! Can you really beat that?! hehe! Thank you so much, Cassie!! hehe! Thank you! Hope you had a great Monday!! Wow Tieghan, this looks totally delicious! 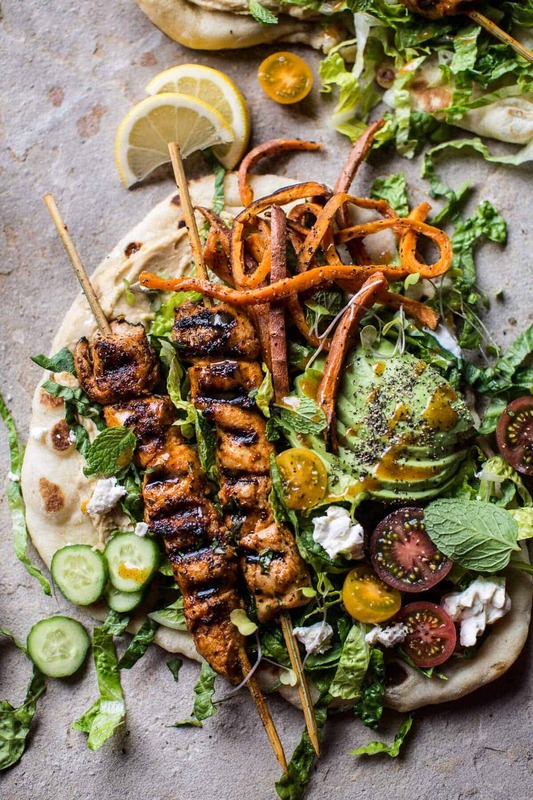 I can totally get behind this salad, especially since there are sweet potato fries in there. This looks amazingly delicious, as do your pictures! 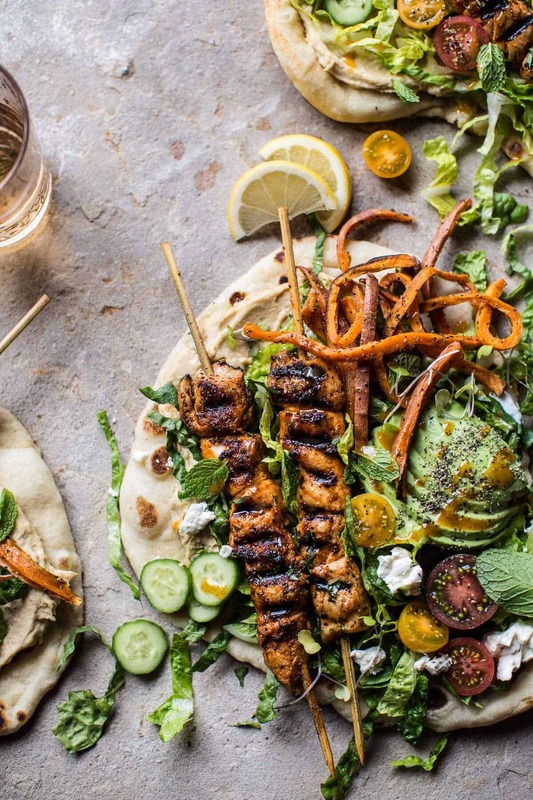 This looks like a really energizing plate! This was an interesting play on a fattoush salad. I’m sorry to say it didn’t do it for me. 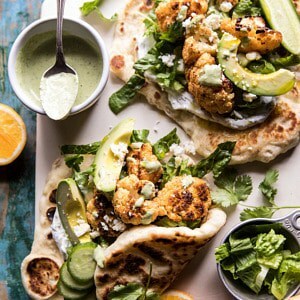 The pita was soggy and the avocado, along with chipotle chile tahini seemed out of place. 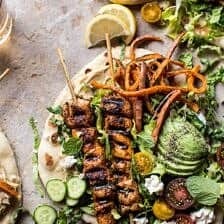 A fattoush salad is bright (sumac), light (pita is crispy and used sparingly) and usually made with lamb – although I had no trouble with the chicken. It seemed to be a hybrid between a Levantine bread salad and a Mexican taco. I think your photography is amazing and you stage your dishes really well. Thank you, sorry it was not for you. Yummmm! Shawarma is my favorite! And your photography is my second favorite! Seriously–stunning! Yum, I’m so all over this. That’s so cool that you have a brother like Kai to help you out. I can’t wait to see the videos! It is very awesome for sure! Thanks Tori! I plan on trying this tomorrow- want to make my own hummus, was looking through your hummus recipes .. Any one in particular you would recommend pairing with this? 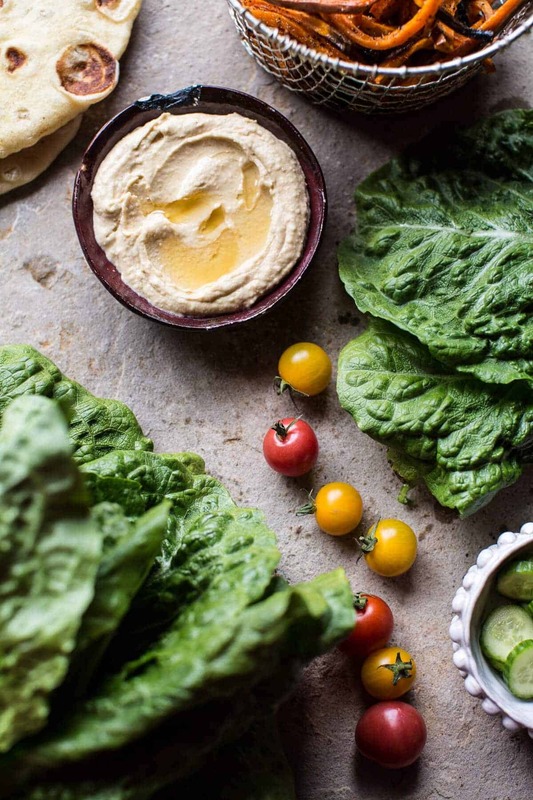 Or have advice on a basic hummus recipe ? Wow just made this and it was beautiful. I had to improvise with the chipotle chile in adobo because living in a small country town it’s sometimes hard to get everything but it was still so so good. Well I must tell how excited I am to find this chicken shawarma. There used to be a friend who used to make it for me. He marinated the meat for about 5 days. I will be making this every soon. I made this tonight, but without the sweet potato fries. It’s easy, beautiful and so delicious! Perfect for al fresco dining in Florida! So happy you love it! Thanks! I made this for dinner last week and it really was delicious. In fact, surprisingly, it was fabulous as leftovers as well. Chicken usually gets rubbery when you reheat it but this was wonderful. Will be making this with the naan again and again. Thank you! We had this for dinner last night and it was AWESOME. Thank you for providing so many amaing, nourishing, beautiful recipes!! I made the chicken skewers this past weekend for my boyfriend and I and they turned out delicious! I added some bell pepper and onion to the skewers and served with garlic naan and tabbouleh salad…the skewers had SO MUCH FLAVOR! Can’t wait to make them again! So happy to hear you liked them Nikki! Nice little touch! sound yummy!! Thanks!! Made this for my family for dinner tonight and we all loved it! Thanks for a great recipe! This is what my food dreams are made of?! Going to try!! Hope you love it Tracie!! Thank you! GAH! To anyone contemplating this recipe…after you’ve made the Carmalized Pork Ramen Noodle Soup (you’ll thank me and the author) gather the ingredients for this creation and make it! Once again, it was a household hit. Well, the 6 year old not so much but he’s still developing his taste. 🙂 Off to scour the recipes for tomorrow night’s meal!! You are so very talented. This was soooooo good and totally delivered. 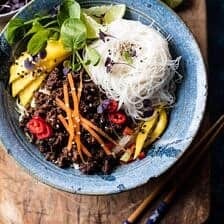 Love your recipes and food styling! This was wonderful!! I used store bought tahini and hummus but the chicken in that marinade was amazing!